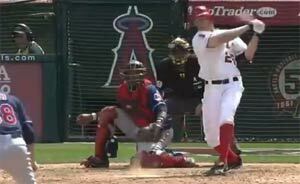 Baseball Prospectus | Pebble Hunting: Who's Faster, Mike Trout or Peter Bourjos? 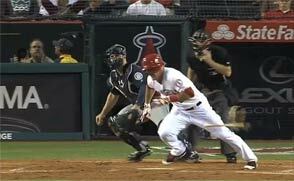 Who's Faster, Mike Trout or Peter Bourjos? 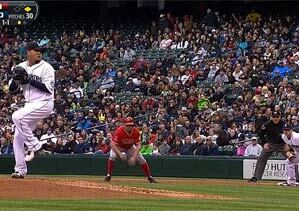 Mike Trout is fast, and Peter Bourjos is fast, but that was never enough for us. "I’d like to be in the 40s," said Bourjos, referring to his potential stolen-base total, as he was interviewed at the Cardinals’ Winter Warm-Up, which wrapped up Monday. Among the great statistical marvels of the past few years, Bourjos’ stolen base totals are among the weirdest. In 2012, Bourjos—quite possibly the fastest player in the Ameican League (though you’ll never know… No one will ever know)—stole three bases, in 101 games. He was tied with Jonny Gomes. 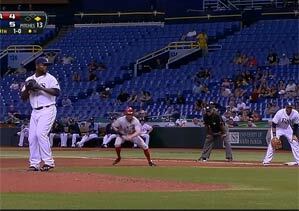 Tied with Raul Ibanez. Tied with Carlos Lee. Tied with Yonder Alonso. He was tied with Jose Molina. So, in these final few days before we see Peter Bourjos in a different team’s uniform, let’s explore the question: Can Peter Bourjos really be as fast as Mike Trout, and steal as few bases as Jose Molina? Found two similar triples, both close enough to require a slide, both with no runners on base to slow them down, both hit to hustle-out-of-the-box parts of the field. So that settles it! 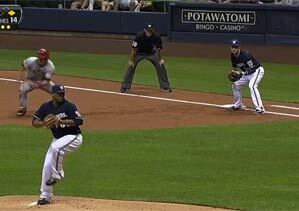 Bourjos is faster. But for two problems. One is that the most common answer to the question, from the Angels' clubhouse, was that Trout was faster in short distances but that Bourjos picked up more speed with space to roam. This might just confirm that. 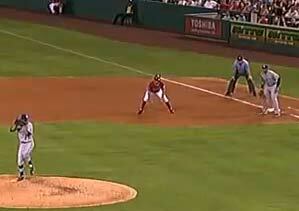 The other is that Bourjos might have simply cut a corner better, or Trout might have slid more slowly, or whatever. So for the latter let’s a) watch and b) split it into segments. But we still know nothing about peak straight-line speed, or the frantic out-of-the-box start speed that characterizes home to first. This is only one swing for each, of course, but it’s fairly consistent anytime they have to run hard out of the box: Bourjos’ first movement is always stepping backward with his front (left) foot. 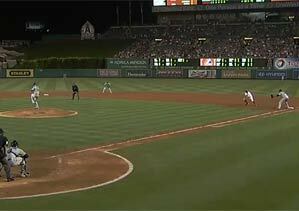 Trout’s is much less so—he's more direct and more explosive to first. 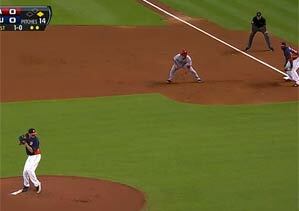 But Bourjos must be slower on stolen bases. He hardly ever attempts steals—10 in the past two seasons—and the last time he attempted a lot, in 2011, he had a poor success rate: 22 for 31. He must get worse jumps, he must get slow starts, he must wander off in search of blackberries on his way to second. So, with no sign that Bourjos gets worse jumps—indeed, the opposite—we turn to the next question: Does he get slower starts or, in some other way, get to second more slowly? Here's each runner arriving at second on what I considered his best jump: the fifth pair of images above. You can see, again, the margins we're dealing with: Bourjos and Trout are both extremely fast, almost equally fast, Bourjos appears to have the edge (3.47 seconds to 3.53 seconds, according to a frame-by-frame calculation), but if for some reason we're measuring wrong and Trout has the edge, it's a negligible difference. So what’s left? Well, maybe Bourjos’ leads aren’t as large—though, actually, that shouldn’t matter if he’s getting to the bag just as fast/faster than Trout. Maybe Bourjos’ instincts are no good; maybe he’s just no good at intuiting when an offspeed pitch is coming, or when a high fastball is coming, or when a slidestep or a pitchout is coming, or when he shouldn’t take the bat out of the hitter’s hand. 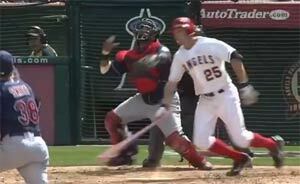 The Angels have a reputation for being steal-crazy, but they also put a lot of stop signs on their runners, particularly young runners, and that included (especially includes) Bourjos and Trout. 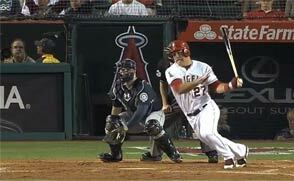 It could be as simple as the Angels concluding that Bourjos can’t be trusted to run and restricting how often he runs. If that’s the case, then he might be in line to make a lot more attempts while he’s with the Cardinals. In which case, it might come down to whether the Angels were right about him or not. It certainly won’t come down to his speed. Thanks to Nick Wheatley-Schaller for technical assistance. 8 comments have been left for this article. Vs. Billy Hamilton soon? :) Great stuff Sam, you're a tremendous addition to the BP lineup. I'd read one of these every single day if possible. Thanks, Sam. Stolen bases are only partially about speed. It helps, but most guys are just not cut out for it. Getting caught is embarrassing... It takes something unique to get right out there and try again. If the difference between Bourjos and Trout in terms of steals is attributable only to reluctance on the part of Bourjos, that falls squarely on the coaching staff to fix promptly. With a free market value of several hundred thousand dollars per run created, that excuse doesn't fly. 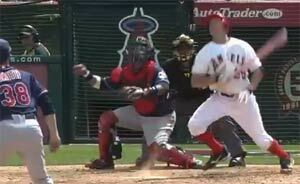 "Maybe Bourjos’ instincts are no good; maybe he’s just no good at intuiting when an offspeed pitch is coming, or when a high fastball is coming . . . ."
This might also explain why he bats like Bourjos and not like Trout. 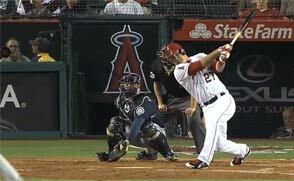 This is why Big Mike (Coach Scioscia) hates his current team. 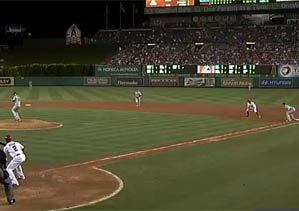 In 2013 the Angels stole 83 bases. 83. That's almost half as much as the top 3 teams stole. There's no way he's taking the bat out of the hands of Trout, Hamilton, Pujols, Trumbo or at least his boss doesn't want him to. 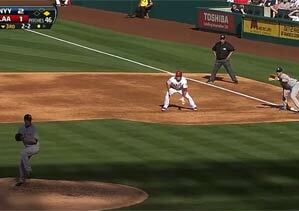 Also Scioscia is much more fond of hit and runs than steals, but even that I see less and less. 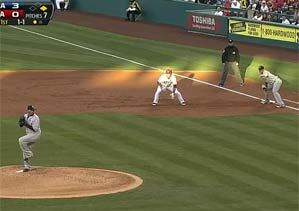 The Angels did not look like an aggressive team last year. They constantly looked like a team waiting for a miracle or a coaching change. They looked leaderless, from the stands, and that lazy OC crowd isn't going to fire anyone up either. I would not be surprised one bit if Borjous stole 35+ bases this year. If he can stay healthy. 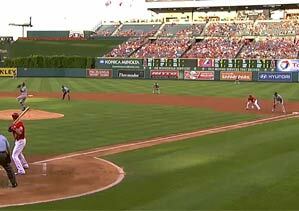 You might be right but I'm not sure if Bourjos can get on-base enough. We still don't know how they are going to be using him. I would assume as a starting outfielder but he may be put into the fourth outfielder spot again. In the end, I could I think that it is very possible for him to get around 30 SBs if they give him free reign. My two cents.